Last Friday night brought us some exciting football among games featuring teams ranked in the Kpreps Top Five poll. Close wins, close losses, overtimes, and double overtime all highlighted the Week Three schedule. Let’s take a look at how Friday’s action impacted the Week Four Kpreps Rankings. Remember to visit the Rankings page to view a complete list of the top five teams in each classification and how they performed last week. Perhaps the game of the night in Week Three was in Class 6A where No. 2 Olathe North held off No. 5 Olathe South 27-26 in double overtime. The Eagles and Falcons remain at those same spots in this week’s poll. The only change in the 6A poll is Topeka High climbing one spot to No. 3 after a 62-12 thrashing of Topeka Highland Park, and Blue Valley dropping to No. 4 after falling 42-21 at 4A-I No. 1 Bishop Miege. The defending 5A champion Tigers are still going to cause problems for a lot of teams, but the entire state found out how good Miege on Friday night. Shawnee Mission East remains atop the 6A poll after cruising past Shawnee Mission Northwest, 41-6. There is quite a bit of shake-up towards the bottom of our 5A poll this week after Maize lost 29-28 at Salina Central. As a result, our voters dropped the Eagles out of this week’s top five. Salina South moves up one spot to replace Maize at No. 3 this week. Randy Dreiling and St. Thomas Aquinas makes their first appearance in the poll at No. 4 after shutting down a high-octane Blue Valley Northwest offense in a 35-7 win. Pittsburg remains at No. 5 after an impressive shutout of rival Fort Scott. Speaking of rivalries, No. 1 Bishop Carroll had little trouble with Kapaun Mt. Carmel in a 49-7 win. The Golden Eagles host No. 2 Wichita Heights this week in a huge game. The Falcons rallied in the fourth quarter to win at Dodge City 26-21 on Friday night. 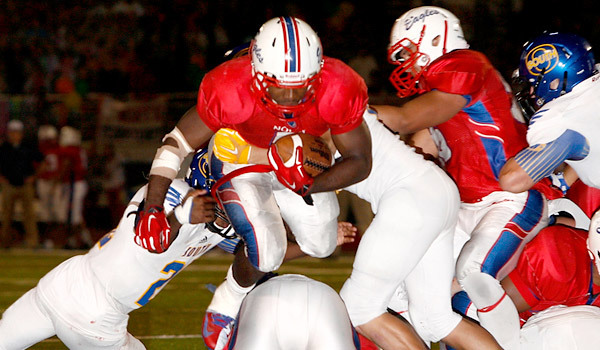 As mentioned above, Bishop Miege had perhaps the most impressive performance in Week 3 in beating Blue Valley 42-21. The Stags jumped out to a 42-7 halftime lead behind four touchdown passes by Ryan Willis. Miege will get another test this week when the Stags play 5A No. 4 St. Thomas Aquinas. Topeka Hayden falls one spot to No. 3 in this week’s poll after Manhattan kicked a late field goal to top the Wildcats, 23-20. Hays replaces the Wildcats at No. 2 after holding off Liberal 42-28 behind a huge rushing night by quarterback Alex Delton. KC Piper rode its defense again with a 24-0 road shutout of Louisburg. The Pirates are ranked fourth this week and will be heavy favorites against winless Bishop Ward. Defending 4A champions Buhler is back in the poll at No. 5 this week after using a big second half to beat Winfield 50-15. The Crusaders replace last week’s No. 5 Ulysses which lost 17-14 in overtime to 4A-II No. 4 Holcomb. In 4A-II, top-ranked Andale survived a scare from 3A No. 5 Wichita Collegiate. The Indians got a Hack Eck touchdown in the fourth quarter and then later ran the clock out for a 34-28 win. Second-ranked Columbus picked up a hard-fought win over Galena 27-6. The Titans led 7-0 at halftime before taking advantage of a couple of turnovers to pull away. Holton remains at No. 3 after running past Sabetha 42-12, and Holcomb remains ranked fourth after the Longhorns’ aforementioned overtime win over Ulysses. Trey Teeter kicked a 31-yard field goal in overtime to propel Holcomb to the win. Wamego cruised past Marysville 55-9 last week, but should be tested by unbeaten Abilene this week. There is only a slight change in the Class 3A poll this week as our voters moved Scott City up to No. 3 after a convincing 65-12 win over Goodland. The Beavers, ranked fourth last week, trade places in the poll with new No. 4 Conway Springs. The Cardinals were impressive in beating rival Garden Plain 25-7 last week. Wichita Collegiate remains in the No. 5 spot despite falling 34-28 to 4A-II No.1 Andale. Silver Lake and Rossville remain atop the 3A poll after convincing wins over Mid East League opponents. The top two teams in the Class 2-1A poll survived scares but held on for victories. Top-ranked La Crosse built a 24-point lead by halftime, but had to hold off Minneapolis 33-29. Meanwhile, Meade held off Southwestern Heights 24-21. The Buffaloes get another good test this week against Cimarron. Olpe remains at No. 3 in this week’s poll after a dominating win at Eureka. The only change in the poll is in the fourth and fifth spots as Phillipsburg and Smith Center trade places in this week’s poll. The Panthers are ranked fourth after a 27-0 win over Plainville, while Smith Center beat Thomas More Prep 30-22. Neither of our Eight-Man polls had a change this week. Hanover remains on top of the 8M-I poll after drilling Wakefield 52-6 in a game that ended at halftime. Osborne, Central Plains, Spearville, and Madison round out the Division I top five, respectively. The Division II poll also had no change this week. Only No. 2 Beloit St. John’s-Tipton yielded any points this week as the Blujays defeated Southern Cloud 66-20. The remaining four teams posted shutouts. Top-ranked Chetopa beat Pleasanton 70-0, but will face their sternest regular season test when they travel to Uniontown this week. Olathe North, Olathe South, Topeka High, Topeka Highland Park, Blue Valley, Bishop Miege, Shawnee Mission East, Shawnee Mission Northwest, Maize, Salina Central, Salina South, St. Thomas Aquinas, Blue Valley Northwest, Pittsburg, Fort Scott, Bishop Carroll, Kapaun Mt. Carmel, Wichita Heights, Dodge City, Topeka Hayden, Manhattan, Hays, Liberal, KC Piper, Louisburg, Bishop Ward, Buhler, Winfield, Ulysses, Holcomb, Andale, Wichita Collegiate, Columbus, Galena, Holton, Sabetha, Wamego, Marysville, Abilene, Scott City, Goodland, Conway Springs, Garden Plain, Silver Lake, Rossville, La Crosse, Minneapolis, Meade, Southwestern Heights, Cimarron, Olpe, Eureka, Phillipsburg, Smith Center, Plainville, Thomas More Prep, Hanover, Wakefield, Osborne, Spearville, Central Plains, Madison, Beloit St. Johns-Tipton, Southern Cloud, Chetopa, Pleasanton, Uniontown, Thunder Ridge, Victoria, Sharon Springs-Wallace Co.